Press TV – Thousands of Yemenis have rallied in the capital Sana’a to protest against a US plan to imminently relocate American embassy from Tel Aviv to Jerusalem al-Quds. The Friday rally saw protesters carry huge Yemeni and Palestinian flags, and chant pro-Palestinian slogans. “We are standing by their side with our arms, souls, and blood until the liberation of Jerusalem. This is the path that we are on,” one of the protesters Abu Hajar said. Last December, US President Donald Trump defied global warnings and formally recognized Jerusalem al-Quds as the “capital” of Israel. Breaking with decades of American policy, he said the US would soon begin the process of moving its embassy there. Trump’s declaration has sent shockwaves throughout the Muslim world and even prompted warnings from Washington’s allies in the West that it would bring more chaos to the region. Washington, however, says the diplomatic mission will be relocated later this month to coincide with the anniversary of the creation of Israel in 1948. Aqeel bin Sabr, another demonstrator, said, “We unequivocally refuse for al-Quds to be made an Israeli settlement. We fully reject this, and we know that the Saudi entity is a supporter and a twin to the Zionist entity, and that the [Persian] Gulf regimes were put in place to protect and serve” Israelis. Saudi Arabia, which has been leading a three-year war on Yemen to reinstate the country’s Riyadh-allied former officials, is seeking closer relations with Israel as part of its plan to counter Iran, which it views as a regional rival. Early last month, Saudi Crown Prince Mohammed bin Salman told The Atlantic that “Israelis are entitled to their own land.” The remarks were widely interpreted as Riyadh’s tacit way of recognizing Israel, which it had been, at least verbally, opposing for decades. On Thursday, Anwar Eshki, a former Saudi general, who currently serves as chairman of the Middle East Center for Strategic and Legal Studies in the kingdom, said that Saudi Arabia was not obliged to defend the people of Palestine against the Israeli occupation. 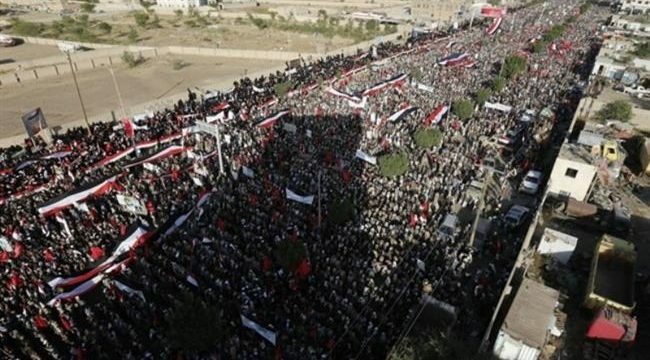 The protest in Sana’a also comes amid stepped-up Saudi attacks on the Yemeni capital, where people have taken to the streets in massive numbers to condemn the kingdom’s aggression. Last Saturday, tens of thousands braved Saudi air raids to hold a funeral procession for a senior official from the Houthi Ansarullah movement who had been killed in an airstrike.